Zentralny Shachmatny Klub (Central Chess Club), Moscow. Around the walls of Moscow’s Central Chess Club are portraits of the world’s greatest Chess players. 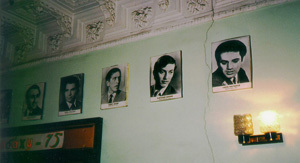 In the photo are Kasparov, Karpov, Fischer, Spassky, and Petrosian. There was a tournament going on when I visited. Everyone there was rated over 2000, that is at least Expert. I played three quick games with a 14-year-old kid taking a break from the tournament, lost two and was happy to draw the third. 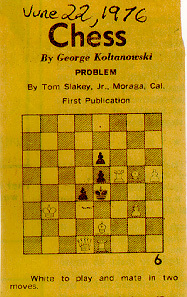 When I was 16, the San Francisco Chronicle published a chess problem I had composed (see problem at right). If you can’t figure out the answer, I’ll send it to you if you email me at thomasjohn916@gmail.com. 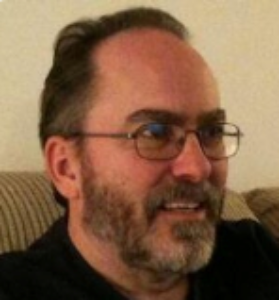 Regular Chess: The USCF and FIDE ratings go from zero to twentynine hundred something, the all-time high. Beginning players quickly reach a rating of a few hundred, and then begin slowly working their way up. I knew people in the Albuquerque chess club who had been playing for years and had a rating of 1000 or 1200. The ratings are set up so that if you are 200 points higher than another person, you win approximately three out of four games against them. I am rated 1804, an “A” player. This means I win one of four games against an Expert (2000), one of sixteen against a Master (2200), one in sixty-four against a Grandmaster (2400). This is a terrific game, full of action. Regular chess players sometimes don’t like to have Madhouse players in their club, because the Madhousers forget their surroundings and become very noisy in their excitement over the game. In the classic version, four players play on two chessboards side by side. If I am playing white, then my teammate sitting next to me is black on the other board. When my teammate takes a (white) piece on his board, he passes it to me, and as one of my turns I can put the piece anywhere on my board as one of my own (except that pawns can’t be placed in the last rank). Two clocks are used, with five minutes on each clock. Strategy involves trading fast on one board to amass an arsenal of captured pieces, then dropping in paratrooper after paratrooper on the other board in a forcing attack. I knew a Madhouse Grandmaster, rated above 2600. He could singlehandedly take on three boards at once. There are a couple more rules, which I don’t list for the sake of brevity. The variants of Chess around the world are many and fascinating. I’ve sometimes felt that the Japanese variant is even better than regular western chess. It’s similar to madhouse in that captured pieces can be put back on the board as one’s own. A game played on a grid of 19×19 lines, with black and white stones placed on their intersections. Possibly the world’s greatest board game. A fascinating feature of this game, that may be unfamiliar to many go players, is its parallels to Eastern philosophy, as for example in the Tao Teh Ching by Lao Tsu. I know fifteen ways of juggling three balls, three ways of juggling four, and a cheating way to juggle five. My next project is to learn to juggle five correctly. I also juggle pins. My excuse is that I was in the Peace Corps near Timbuktu, and didn’t have many entertainment options after work hours. I had seen a book on how to solve this four years before, but had not memorized it at all. Thus I am indebted to the book only for its system of labeling the cube, which I remembered. Using only that, I was able generate my own solution to the cube (from any position, of course) in two and a half weeks of ten-hour days. It’s annoying to hear people talk about “solving Rubik’s Cube,” when all they did is memorize someone else’s solution. Why not try really solving it yourself from scratch?